Hope we are all well. So I have decided to plant a Clematis Piilu and an Arthur bell Rose to grow up my fence panel by the patio. I will be using vine eye and wire to build my climbing support on the fence. I have read somewhere on this forum that a 30cm spacing, both vertical and horizontal is sufficient. I have also read that clematis need to grab onto something every 6 inches? Is my 30cm spacing sufficient or do I need to reduce it although seeing as I am planting a rose as well, I am tempted to leave it. They both roughly have same pruning needs so hopefully, pruning shouldn't be an issue. Also, what should my actual planting spacing be between each clematis and the rose? I have 4 of the clematis and 2 roses. You thoughts and advise is appreciated as always. I think this post got lost amongst others. Ill'd be grateful if someone can help me please. Thank you! I'm not a landscape designer, but your 30cm spacing sounds alright to me... I have clematis 'Piilu' planted just 1 foot from roses... it's not a hugely vigorous tall clematis that's going to invade all around it, as far as I know, I've grown it before and it didn't do that... so your rose should be ok with it..
Oh thank you so very much Marlorena. Oh please do say what you'd like to say about the colour combination. For me, nothing is set in stone. Ill'd rather have the perfect co-ordination than live with something I do not love. As a gardener I follow in the US says, only plant what you love in your garden. I chose this combination myself with the thoughts that the yellow stamen of the Piilu would complement the Arthur Bell. Do tell, what has your experience been? Do you have a photo to show me please? 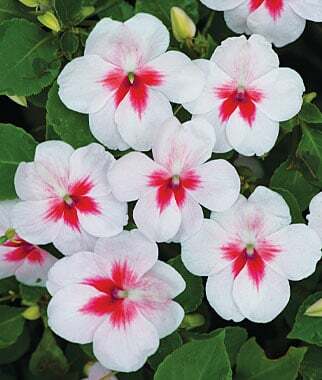 Also, does the Piilu flower well? I will be putting up my wire and planting this weekend so there is time to change my mind. One could never have too many clematis anyway judging by the amount of clematis some on this forum own (Clematis thread - my eyes popped as I read and looked at photos, all so lovely). I will just buy a different type to go with my rose. I have a couple of pretty vigorous clematis near an Arthur Bell and he does fine. Oh thanks B3. Is your Arthur Bell s climber? What are the names of the clematis? Can I bother you with a photo is you have one from when they were all in bloom? Thank you so much. Yes it's a climber. I'll see if I can find one. Sorry your post got missed, sometimes it depends on the time of day or the weather when people are looking at the Forum. 30cms is fine for the rose, but I would put a thinner wire between the 30cms ones for the clematis in between the stronger rose wire. I agree with Marlorena, I'm not a fan of pink and yellow, unless it's pink fading to yellow in the flower itself or yellow stamens. I like purples and blues with yellow. @Busy-Lizzie Thank you. I figured as much about the post getting lost. I only just found this website you suggested this morning on the 'Share your Clematis' thread. I will have a good nose around there. The Piilu has a yellow stamen which is why I thought the Arthur Bell would be perfect. I have never grown either before but I hope my choice of Rose is good even if I might have to change the clematis. Hence, i am keen to see pictures from anyone who has planted either. It's by the patio and I would love it to be striking so if I can get it right first time, I'll be a very happy bunny. I have also come across another website that advocates blues and purples to go with a yellow rose so you might just be right. Thank you once again for taking time to respond. I really meant that the 30 cm wires should be strong and well attached but, to save extra work, the in between ones for the clematis don't have to be so strong, just to stop it flopping down if it hasn't managed to reach the next wire. Garden centres sell different thicknesses of garden wire. My OH loves Screwfix! If you love the colours that's what matters, it's your garden after all and I think all flowers are beautiful anyway. I don't care for all green gardens but some people love them. Just as well we are all different. I tend to take pictures of individual flowers so I can't find one of the clematis with the rose - but you might be able to see some healthy-looking rose foliage - that's Arthur! 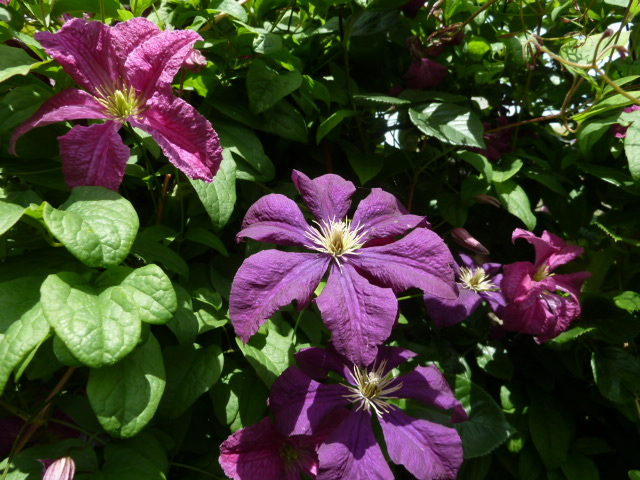 This photo is a bit over exposed, both clematis are a darker,richer colour in real life.